U.S. fighter planes strike at artillery used by Islamic militants in Iraq. Thank you for joining us for today's breaking news that U.S. aircraft had struck targets inside Iraq. We're closing this live blog for now but watch CNN for the latest developments as they happen. Watch live on CNN and we'll bring you key points here too. You can bet the military action will be a main point today. 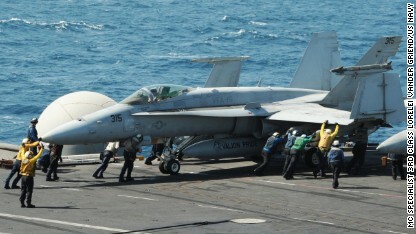 Here are sailors guiding an F/A-18 Hornet on the flight deck of the USS George H.W. Bush earlier today in the Persian Gulf, in a photo released by the Navy. We don't know it was one of the planes used in the airstrike. 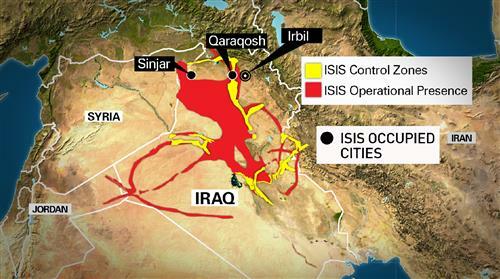 Here's a map from our graphics team showing how ISIS have spread across northern Iraq. Sinjar is the city that the Yazidi minority used to call home; now they've fled to the surrounding mountains. Irbil is in the Kurdish region, now only about 30 miles from the front lines, reports Ivan Watson. From CNN's Hamdi Alkhshali: An Iraqi air strike killed 45 ISIS fighters and injured 60 others Friday in the northern town of Sinjar, the country's state-run National Media Center said. Sinjar is a town that ISIS militants raided last weekend, spurring members of the Yazidi minority to flee into the surrounding mountains. CNN's Ivan Watson shows the desperate straits of people who've fled to Irbil to escape the Islamic State. "Nobody has a plan right now, nobody knows what they're going to do," he reports. The FAA just banned all U.S. airlines from flying over Iraq, "due to the hazardous situation created by the armed conflict." Two F/A-18's dropped 500-pound laser-guided bombs on ISIS mobile artillery nr Erbil. Boehner: Air strikes "appropriate" but he's "dismayed by the ongoing absence of a strategy for countering the grave threat ISIS poses"
“The president’s authorization of airstrikes is appropriate, but like many Americans, I am dismayed by the ongoing absence of a strategy for countering the grave threat ISIS poses to the region. "Vital national interests are at stake, yet the White House has remained disengaged despite warnings from Iraqi leaders, Congress, and even members of its own administration. "Such parochial thinking only emboldens the enemy and squanders the sacrifices Americans have made. "The president needs a long-term strategy – one that defines success as completing our mission, not keeping political promises – and he needs to build the support to sustain it. "If the president is willing to put forward such a strategy, I am ready to listen and work with him. The White House and Congress have been talking about Iraq and possible action there for some time. "The Administration has been consulting closely with Congress about events in Iraq over the past number of weeks and has additionally consulted with Congress on these actions. Consistent with these consultations, we will comply with any applicable reporting requirements in the War Powers Resolution."